Low-brow tweets, then high expectations. Now what...? The nation is on edge today waiting to find out what it will learn from the release of some or all of Special Counsel Robert Mueller’s report on his investigation into Russian meddling in the 2016 elections. It will be hard for the findings to live up to the expectations that have been building since the investigation was begun in May 2017. Connecticut’s two senators – and, in fact, the majority of Congress and the American public – want the entire contents of the report made public. And Sen. Richard Blumenthal, a member of the Judiciary Committee, said he would push for the report to be subpoenaed if U.S. Attorney General William Barr does not release it voluntarily. 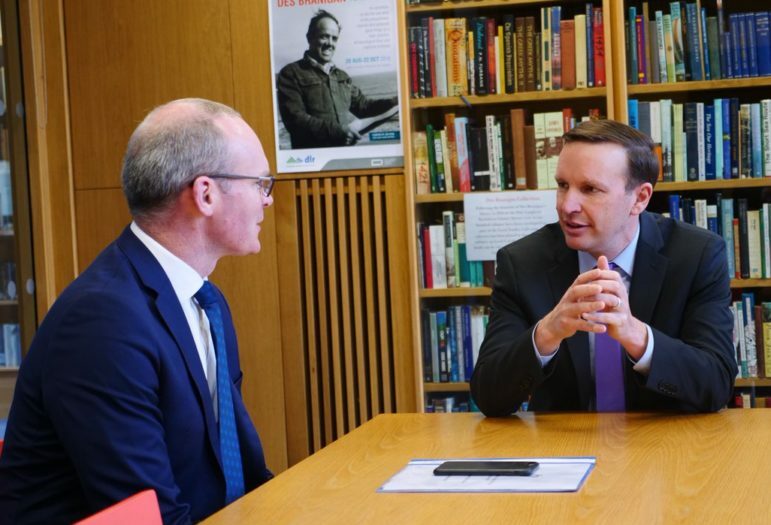 U.S. Sen. Chris Murphy meets in Dublin with Simon Coveney, Deputy Prime Minister of Ireland. “Only transparency and a full accounting of the findings can bring closure to this issue and allow our country to move forward,” added U.S. Rep. Jim Himes, D-4th District. The momentous development at least put in the rear-view mirror what Murphy termed “the slow motion car crash that is our President’s twitter feed these days.” Its most prominent feature was Trump’s ongoing denigration of Murphy’s former colleague, the late Sen. John McCain. It was presidential behavior condemned by former Connecticut Sen. Joe Lieberman in an op-ed published in the Washington Post: “The person who suffers most from the strange, posthumous attacks by the president is the president himself,” Lieberman observed. As is often the case in predominantly blue Connecticut, Trump’s policy announcement supporting “free speech” on college campuses (meaning no federal funds for schools who prevent speakers “from challenging rigid, far-left ideology”) was met with ambivalence, since public schools like the University of Connecticut use the First Amendment as a “guiding principle,” a spokesperson said. On the other hand, neither the Mashantucket Pequot or Mohegan tribes were complaining when the U.S. Department of Interior — in an abrupt reversal possibly related to the criminal investigation of its former secretary Ryan Zinke – announced it would sign off on the construction of a jointly owned casino in East Windsor. And though unemployment is at a 17-year low of 3.8 percent, Connecticut could certainly use the jobs, having lost 400 last month. In fact, one economist sees the lack of job growth as a troubling sign of economic weakness. The state’s financial health, as everyone knows, is not good; and lawmakers are looking for ways to cut expenses, which is seldom a universally popular pursuit. That is likely to be the case with Gov. Ned Lamont’s plan to impose an asset test for the participants in the Medicare Savings Program, a joint federal-state program that helps an estimated 180,000 low-income seniors pay for services Medicare doesn’t. The governor, at least, is capable of responding to criticism when it is heaped upon him, as was the case with his proposal to force small school districts to consolidate or face financial penalties. He has stricken the words “redistricting” and “consolidation” from his proposal. Sen. Norm Needleman, meanwhile, has an alternative plan that would help the small towns save money a share services voluntarily. The lawmakers themselves aren’t asking for and won’t likely be getting pay raises now that a study panel is recommending against them. A toll opponent at the State Capitol. They are, however, pushing forward with three controversial bills that will move the state closer to setting up a system of highway tolls intended to help fund future transportation improvements. 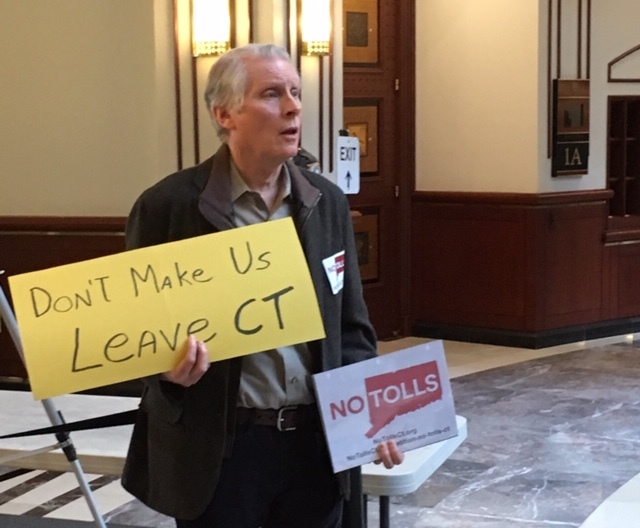 Tolls are about as popular among some as the ideas of a $15 minimum wage and paid family leave are among members of the Connecticut Business and Industry Association, but Lamont told the group those measures are likely to pass the legislature this year. Proposals for a state-administered public option health insurance plan and state-funded healthcare for undocumented families are also gaining steam. And last week the legislature’s Human Services Committee heard testimony as to the need for establishing human services network for the LGBTQ community, whose members, particularly young people, suffer from the effects of stigma and discrimination. Ella Briggs, 11, Connecticut’s openly gay “Kid Governor” this year, knows a little about that. Another bill under consideration at the capitol is one to eliminate the rule that, for religious reasons, allows parents to send their children to school without being vaccinated. Connecticut’s vaccination rate is higher than the national average, but has dropped in recent years. That may in part be due to rhetoric from people like Robert F. Kennedy Jr., who, invited here by two state representatives, denounces vaccines, the science they are based on, and a long list of medical and scientific organizations who support their use.